There’s no doubt about it, owning a horse is a big commitment. With feeding, exercising and mucking out to keep up with, how anyone fits this around their career and children we just don’t know. Yet one lady who does exactly this is Jenny Naylor-Davis. Owning and competing with her own horses alongside a successful career, we were thrilled when she had five minutes to spare (on school holidays may we add) to chat to us about horse care. Whether you are looking for a crash course in clipping, or need to learn more about caring for a foal, this is one lady worth listening to. So Jenny, the obvious place to start – when did you learn to ride? I learnt to ride when I was four years old. I had a wonderful pony called Davy who was very forgiving and kind. Riding was something we were encouraged to do by my family, even though they were not particularly horsey themselves. They provided lots of back up and support over the years and they still do! Since then I have always been involved with horses throughout my life – I even managed to find an equestrian team whilst studying at university in America. Was it always a hobby? It is more than a hobby; it is a way of life for me. However it is not my career – I have always worked in order to pay for my horses and the competitions I compete in. As someone who has always had horses, what is the best part? The best part of looking after a horse is the relationship you get to form with the animal. Each horse has a distinct personality and they respond to your moods, feelings, gestures and voice. It takes time to build up a relationship and the more time you spend caring for them, the more you get to develop your partnership. Once a horse trusts you, they will look to you as leader and do almost anything you ask. Caring for a horse is also a great way to escape from the stresses and strains of everyday life – I often make my best decisions or solve problems at work on the yard. Good answer! What’s the biggest challenge then? Juggling work, family and my horses, especially in the depth of winter when it’s dark and cold. Horses can involve many late nights and very early mornings. They take up all of your spare time, so it helps if your family share your interests. You often compete; can you run us through the most important steps when it comes to getting a horse ready for a show? Well I always work methodically to prepare. I would have spent a lot of time to get ready in terms of the training and fitness of my horses, but as the big day looms there are always lots of practical things to organise. Entries would have to be made a few weeks in advance. Horses need to be shod roughly every six weeks, so I would ensure that this did not coincide with the competition date and that their yearly vaccinations were up to date. The day before I would bath and plait my horse, as ordinarily shows involve early starts! The evening before I would clean all of my tack and pack all the competition gear. On the morning of the show, you have to perform all the normal duties such as feeding and mucking out. Any last minute grooming, washing and plaiting happens before loading the horse onto the lorry and travelling to the show. Once you arrive you need to check in with the show secretary, show your horse’s passport and collect your number. There is usually time to walk the course and familiarise yourself with the surroundings before tacking up and warming your horse up. The actual competition is normally relatively short in comparison to the amount of time it takes to prepare and get there. Great answer! A more general one then, what are the three most important things to remember when it comes to day to day horse care? Firstly, all horses are different. One size doesn’t fit all and different things work for different horses. 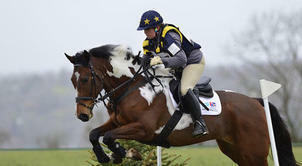 Don’t be scared to try out different things and find something that works well for you, your horse and your situation. Look and learn from your horse – they will let you know if they are unhappy. Secondly, you never stop learning – listen and learn from others. Always be receptive and don’t be scared to ask for advice from friends or professionals. Finally, never cut corners! Horses are live animals that rely on you for their wellbeing. Does horse care vary a lot between summer and winter? Yes definitely, in the winter the horses are stabled at night and have some turnout during daylight hours. They are still exercised but the weather can cut this short – in severe weather we keep them in the stable. In the summer we tend to keep ours in the stable in the day as flies can very irritating and horses can be sensitive to the sun. We turn them out at night with protective rugs and fly masks to keep the flies from their eyes. With longer daylight hours we can ride early or late to avoid excessive heat. How do you cope with a horse that won’t cooperate? You spend a lot of time and money with your horse and it can be upsetting when things don’t go well. Fortunately there are lots of routes to pursue when things don’t go to plan. Ultimately, it is important to check if your horse is medically fit as lots of problems in behaviour can be attributed to medical factors. If they do have a clean bill of health, it’s also important to check that the tack fits correctly. Ill fitting saddles can cause discomfort and will prevent a horse from performing to their best. Feeding regimes can also affect your horse’s mood and behaviour. All of the major feed companies offer advice help-lines and it is important to ensure that your horse is getting food relevant to the exercise it receives and its breed type and care management. There is also an endless market for supplements, herbs and remedies which can help behaviour or health issues. A good riding instructor will be able to work with your horse and sort out any problems that occur. I still have lessons and believe you never stop learning – sometimes a friend or mentor can give a fresh perspective on specific problems. Sometimes however a horse will still be uncooperative. There has been a huge rise recently in natural horsemanship and these techniques are used more and more to deal with unwelcome traits. This relies on developing trust on the ground between you and your horse, whilst desensitising them to scary situations. Horses are flight animals and look for leadership for you. Sometimes this relationship is out of sync and natural horsemanship techniques look to correct this. I recently used some of these techniques on a tricky young horse and had lots of success. Ultimately patience, TLC and good management should provide the right ingredients for having a healthy, happy horse. Finally then, what advice would you give to someone hoping to follow in your footsteps? I believe that anyone can enjoy the thrills, successes and happiness of owning, riding and competing horses. It takes a lot or persistence, determination, time and money but the rewards far outweigh the negatives! I always try to look at the bigger picture. Have a plan and know where you want to get to. If you want to brush up your horse care techniques, take a look at these courses and find the one most suited to you.